This entry in my making of a plug-in series will detail what went into finalizing the prototype program for the Match Envelope plug-in. A prototype of this kind is usually a command-line program wherein much of the code is actually written to implement functionality and features, and then later transferred into a plug-in’s SDK (in my case, the VST SDK). Plug-ins, by their very nature, are not self-executable programs and need a host to run, so it is more efficient to test the fundamental code structure within a command-line program. 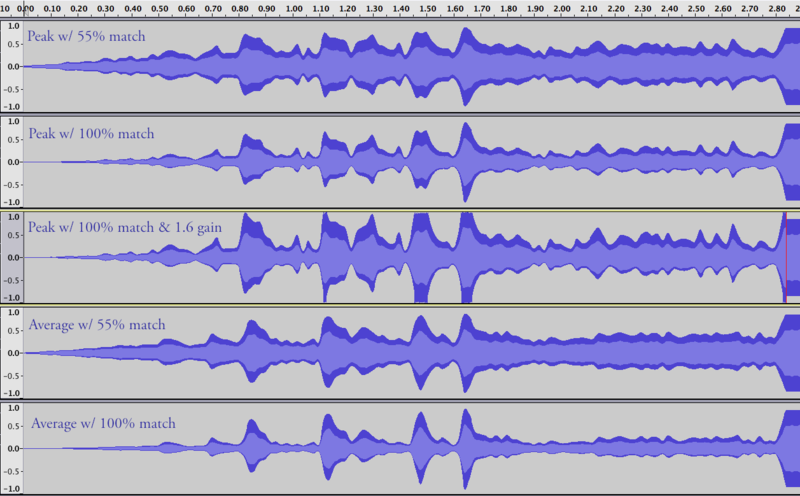 We could see that this mostly gave me the results I was after, but if we look closely at the resulting waveform, there is some asymmetry in comparing it to the original (look at the bottom of the waveforms). One of the mistakes in this formula was in comparing the interpolated value ‘ival’ with the actual sample amplitude of the ‘buffer’. To remedy this, I now also extract the envelope of the destination audio that we are applying the envelope on to (with the same window width used to extract the source envelope) and use this value to compare the difference with ‘ival’. This ensures a more consistent and accurate comparison of amplitudes. I use two strategies when deciding on an appropriate mathematical formula for what I need. One is considering how I want a value to change over time, or over some range of values, and turning to a kind of equation that does that (i.e. should it be a linear change, exponential, logarithmic, cyclical, etc.). This leads to the second method, and that is to use a graph to visualize the shape of change I am after; this leads to an equation that defines that graph. Shortly, we will be seeing some much more interesting musical examples of the plug-in at work. But before that, we can see another feature at work above that I implemented since last time: junction smoothing. where ‘ival’ is the interpolated value and ‘jpos’ is the current position within the bounds of the junction smoothing specified by the user. ‘jpos’ starts at 0, and once the smoothing begins, it increments (within a normalized value) until it hits 1 at the end of the smoothing. The larger ‘jpos’ gets, the less of the actual interpolated value we end up with in our ‘jval’ result, which is used to scale the audio buffer (just as ‘ival’ does outside of junction smoothing). In other words, when ‘jpos’ hits 1, ‘jval’ will be 1 and so we multiply our audio buffer by 1; then we have reached the end of our process and the original audio continues on unmodified. Using this as the source envelope, I used a window size of 250msec at 90% match to apply on to this flute line that I recorded in Logic, doubling the original from the audio above (the flute sample is from Vienna Special Edition). Junction smoothing was of course applied during the process to let the flute line fade out as in its original incarnation. Without smoothing it would have abruptly cut off. This gives us a seamless transition from the end of the flute solo into the orchestral answer. It was very important in this example to specify a fairly large window duration, because we don’t want to capture the tremolo of the original flute solo as this would fight against the tremolo of the sampled recording that we are applying the envelope on to. We can hear a little bit of this in places even with a 250msec window, so this will be something I intend to test further to see how this may be avoided or at least minimized. This brings me to the other major challenge I faced in developing this plug-in since part 1: stereo handling. Dealing with stereo files isn’t complicated in itself, but there were a few complexities I encountered along the way specific to how I wanted the plug-in to behave. Instead of only allowing a 1-to-1 correspondence (i.e. only supporting mono to mono, or stereo to stereo), I decided to allow for the two additional situations of mono to stereo and stereo to mono. This saves on having multiple variables representing channel states for each envelope, so I only have to pass around one variable that contains all of this information that is then parsed in the appropriate places to retrieve this information. 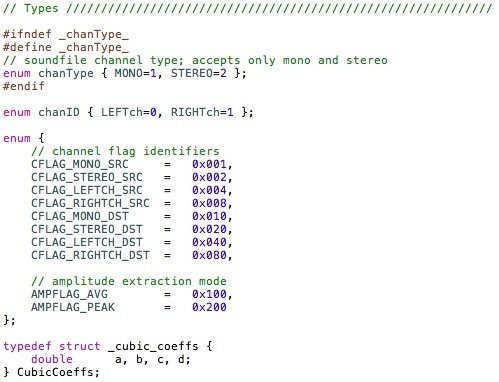 As we can see, only one variable (‘envFlags’) is used in the extraction of the source envelope, and we can find out mono/stereo information by using bitwise AND with the corresponding enum definition of the flag we’re after. Furthermore, in the case of the source envelope being stereo but destination audio being mono, I combine the amplitude data of the two channels into one, according to either average or peak extraction method (also specified by user). 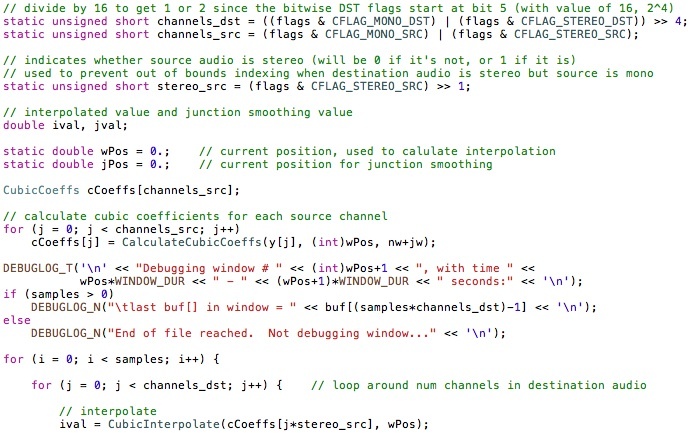 I use another variable (‘stereo_src’) that extracts some information from the bitwise flags to take care of the case where the source envelope is mono but destination audio is stereo. Since the loop covers the channels of the destination audio (in interleaved format), I needed a way to restrict out of bounds indexing of the source envelope. If the source envelope is mono, ‘stereo_src’ will be 0, so the indexing of it will not exceed its limit. If both envelopes are stereo, ‘stereo_src’ will be 1, so it will effectively “follow” the same indexing as the destination audio. This part has really covered the preliminary features of what I’m planning to include in the Match Envelope plug-in. As I stated at the start, the next step is to transfer the code into the VST SDK (that’ll be part 3), but this also comes with its share of considerations and complications, mainly dealing with UI. How should this appear to the user? How do you neatly package it all together to make it easy and efficient to use? How should be parameters be presented so that they are intuitive? Most all plug-ins/hosts offer up a default UI, which is what I’ll be working with initially, but eventually a nice graphic custom GUI will be needed (part 4? 5? 42?). This entry was posted in Audio, Programming and tagged C/C++, compression, cubic interpolation, DSP, envelope, envelope following, GUI, interpolation, plug-in, side chain compression, UI, VST on July 28, 2012 by Chris. Well, it’s finally time to do something useful with all this stuff. Not that command-line programs aren’t useful, but they have their limitations — especially these days. Making a plug-in is a great way to apply all the things I’ve been doing, which really culminates into making a deliverable product that has a use. I have thus decided to make a Match Envelope plug-in, inspired by a suggestion from my good friend Igor (thanks man!). This first part of the “making of” blog will cover some of the initial conception and development of the prototype program as well as introducing some of the planned features and parameters of the plug-in. Focus will not be on actual C++ code at this point, but more on the math and the concepts behind it. This Match Envelope plug-in will be similar in many ways to an Envelope Follower. It extracts the envelope from a source audio file and applies it to a destination audio file. Envelope followers tend to be more geared towards MIDI and there are not too many (to my knowledge) stand-alone plug-ins that give you what you need. They can also be found as features in filters and other kinds of plug-ins. The usefulness of them can vary quite a bit as we will see in more detail. Commonly we see Envelope Followers used to sync up a sound to a drum loop for example. Another benefit of using this plug-in involves layering sounds together. If a seamless blend is desired, the envelopes of the different layers must match fairly close or else we will hear the distinct layers. With a mix of more percussive sounds with sustained ones, an envelope matcher can be quite useful. Furthermore, Match Envelope can be used to approximate the attack or release of instruments in an orchestra that have been recorded. Let’s say you wish to double the flute line, or even the bass line with something; the Match Envelope plug-in can assist in blending the two layers together. As will be discussed below, there will be parameters and features to control the effect because there are situations where we certainly don’t want a “lifeless” 100% match. In addition to its uses in music, it can also be used in sound design, where layers upon layers of different sound sources are often combined to great effect. Given some of the cool and varied applications of this plug-in, and considering that there are not a great many of them out there, I felt this was an exciting project to take on! So how does it work and where do we start? To extract the envelope shape from the source audio, we use windows of a certain size that will either take the peak amplitude or the average amplitude within that window and store it in a buffer. We then take those amplitude values and apply them onto the destination audio, effectively recreating its amplitude shape. Fairly straightforward in concept, but there’s more to it than that. There was one problem I encountered after implementing this, however, that is worth mentioning. My window sizes were not of the unit value (1) and even moreso, can be changed by the user, so I did not have a constant for the distance between x values. The solution is pretty simple (almost too much so as I was heavily focused on workarounds that were far too complex). Basically we just scale the x increment value, which keeps track of our position, by the inverse of the window duration. Let’s say we set our window duration to 20 milliseconds. That gives us our window size of 882 samples (assuming a sample rate of 44.1kHz). Our x increment value is then 2.268×10-5 (0.02 / 882) based on a window size of 0.02. But we need a window size that is effectively 1, so 1 / 0.02 is 50, and this is our scaling factor. The increment value is now 1.1334×10-3. One final detail that caused a small issue was rounding error. At the boundaries of some windows, I would end up with an x value of 3.999999 or similar. This caused sample error that did not sound very good, but the solution was a simple matter of adding a very small value to the x position at the end of each window loop (0.0000001 for instance). Some additional testing with varying window sizes will be done to make sure no more sample/rounding error occurs. While on the topic of windows, their function is to affect the smoothness of the extracted envelope as well as its accuracy. Smaller window sizes will result in a closer match to the source audio’s envelope, and larger ones will be more of an approximation. Before moving on, let’s get a visual of how I’m testing out the functionality of the plug-in. To really get a good idea of how the program is working, using something simple like a triangle wave is great for visualizing the outcome. As I mentioned previously, there are two ways of taking the amplitude within each window: taking the maximum (peak) value, or taking the average. Just below we see the difference between them, and it is the intention at this point to have this as an option for which to use. Here we can see a number of things already at work. The difference between peak and average amplitude is not very much. 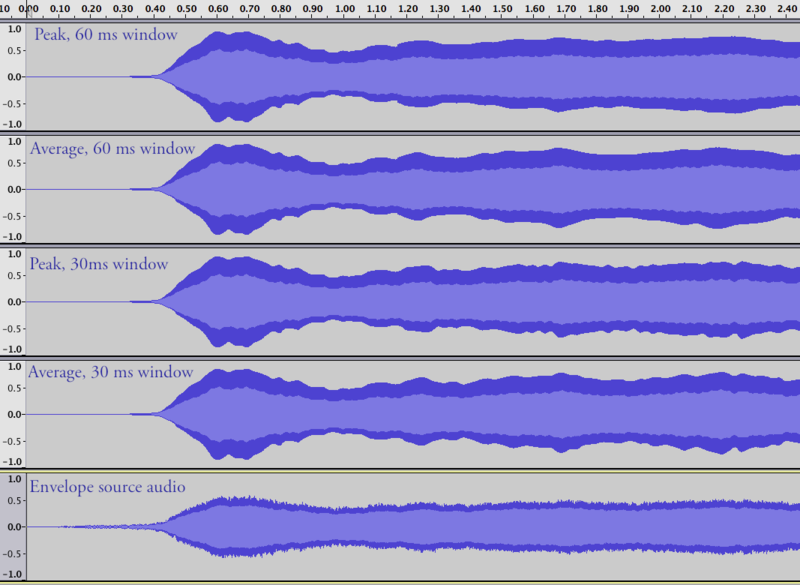 But in this case, the source audio is quite smooth and the destination waveform is completely constant. A following example will demonstrate the difference between these better. We also see the effects of different window sizes in the visual above. A very large window size (perhaps around 500 ms to 1 s) would retain much more of the shape of the destination audio and might be more useful for longer sustained sounds, while a shorter window length is better for capturing percussive sounds. The example below uses a different audio as the source, with more percussive attacks. There is a clear difference between peak and average, at least visually. We will hear at the end of this post that they don’t differ a huge amount to our ears (at least not with these examples). Before I wrap up this post, I want to discuss two additional features I’m planning at this point. One is just a simple gain, that scales the result of the envelope match. An extension of this feature will be to add an option where the user can specify that the amplitude at the end of the envelope will match the amplitude of the rest of the audio (i.e. at the junction point where the envelope ends, and the rest of the audio continues unmodified). This would be useful if the user just wants to match a section from a source audio file. 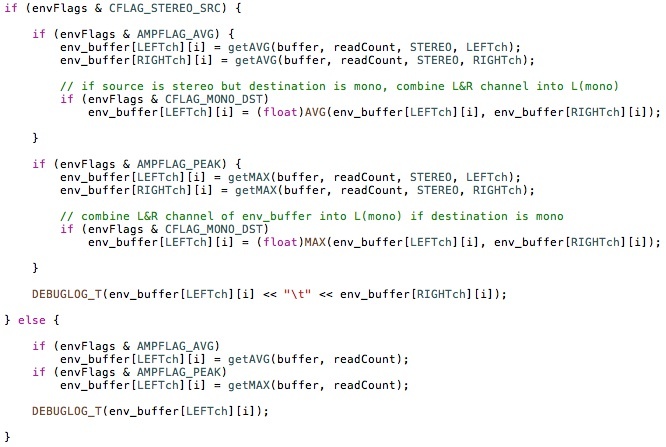 where buffer is the amplitude of the destination audio and a is a value in % specified by the user. We can see it visually in the image below. The bigger the distance between the two amplitudes, the stronger the envelope affects the audio. This ensures that the general shape of the envelope remains, while retaining more of the original shape in relation to the specified % by the user. The middle waveform shows a gain factor of 1.6, but this was incorrectly implemented, as the gain modifies the interpolated value, ival, instead of the result of ival * buffer. As it is in the image above, gain is also proportional, but I intend it to be a linear effect. Here are a couple of examples of how this process sounds at this stage. These audio samples use just the triangle wave that I have been using to test the program layered on top of the audio I extracted the envelope from. Listen to how the triangle wave follows the shape of the audio and see if you can hear a difference between the peak version and the average version (the peak version has slightly stronger attacks from the triangle wave). This has been a long and wordy post, so it’s time to wrap up. I’m pleased so far with the functionality and behavior of the plug-in and the parameters and features I am planning on implementing. It should provide a good amount of flexibility to shape a given waveform/audio file from an extracted envelope source, and should have some fun and productive uses. This entry was posted in Audio, Programming and tagged ADSR, average, cubic interpolation, envelope, envelope following, filter, interpolation, linear interpolation, match envelope, peak, plug-in on July 10, 2012 by Chris.